Description: Cap: 5 to 12 cm, convex, becoming centrally depressed and vase-shaped; margin inrolled when young, sometimes upturned in age; surface viscid when moist; banded concentrically with shades of orange; often developing green discolorations in age; flesh thick, brittle, bleeding a sparse, dark red latex when cut; taste and odor mild. 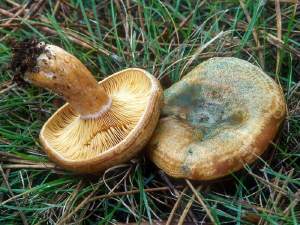 Gills: running down stem, narrow, close to crowded, dull orange, bleeding a dark red latex. Stem: 2 to 5 cm tall, 1.0 to 2.5 cm thick, solid and brittle when young, hollow in age, equal to tapered at the base; surface smooth, unpolished, dull orange-buff, bruising green where handled. Spore print: pale yellow. Habitat: Scattered to gregarious with conifers, especially Douglas fir second growth; both fringes understory. Primary Keys: Cap and stem snap cleanly (unless wormy), scant ruby colored latex when snapped (especially at gill/cap interface), concentrically banded cap, slow blue-green staining (sometimes already present in older specimens); latex not yellow, white or purple; taste not peppery or bitter. This Spanish dish serves two for breakfast, and the side-by-side presentation features the mushrooms as a separate flavor. The recipe can also be assembled as scrambled eggs or an omelet. With more cream or half-and-half and doubling the recipe, it easily converts to a quiche filling or a frittata. Beat egg, cream, and salt and pepper. Set aside. Heat 2 T. of olive oil in skillet and saute mushrooms, onions, and garlic over medium-low heat until mushrooms are cooked and liquid has evaporated. Add sherry, salt and pepper to taste, and continue cooking and stirring until liquid has condensed into a sauce. Remove mushroom mixture and keep warm. Clean and reheat skillet. Add and heat remaining oil, then pour beaten eggs into skillet. Stir with wooden spoon periodically until the eggs are cooked soft. Place the scrambled eggs on one side of serving platter and place the mushroom mixture on the other side. Sprinkle parsley over all and serve.